Escape to this beautiful, rural, historic area with pretty old towns, covered bridges, glacial lakes, little vineyards, and the foothills of the Berkshires. Northwest of Hartford, Connecticut is beautiful country of rolling hills, forests, farms and lakes. A pleasant morning or afternoon can be spent driving from New York City, Hartford or the Berkshires to Litchfield. Once a thriving colonial town, industrial development passed Litchfield by in the 1800s, which seemed a tragedy at the time, but it resulted in the preservation intact of one of the most beautiful 19th-century towns in New England. Litchfield county, surrounding the town of Litchfield, is all forest, rivers, and rolling hills, some of the prettiest country in this exceptionally pretty state. 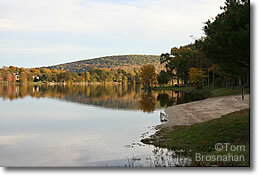 Deeper into the northwest corner of the state you will come upon other charming towns, country inns, and resorts nestled in the Litchfield Hills (Connecticut's "Berkshires") and scattered on the shores of clear lakes such as Lake Waramaug. In the charming old town of Salisbury, you're only 4 miles from the Massachusetts state line, and 12 miles from the southern Berkshire Hills town of South Egremont. The Connecticut River Valley has the right conditions for growing a premium wrapper leaf for cigars, the famous Connecticut Valley shade-grown tobacco. With the decline of tobacco use, the Connecticut tobacco industry is withering, but you may still see some tobacco fields, and next to them the long barns for drying the tobacco leaves. Part of the year the crop will be covered with gauze enclosures to protect it from too much direct sun, hence the "shade-grown" name.